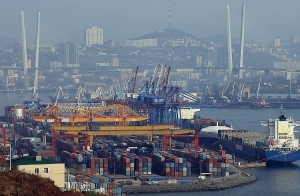 Vladivostok Commercial Sea Port (VTSP, Port, part of the FESCO Transport Group) set an absolute record of transshipment - for 9 months 2018 of the year the Port handled more than 7,7 million tons of goods of various nomenclature, which is 40% higher than the level of 9 months of 2017 of the year and the Port's cargo turnover for the whole record year 2017 (7,5 million tons). Container turnover for 9 months 2018 of the year increased by 15% over the same period last year and amounted to 393 thousand TEU, handling of vehicles - by 74%, to 43,7 thousand units, to general cargo - by 77%, to 3,8 million tons. The average monthly transshipment volume for 9 months of 2018 increased by 40% and reached 857,5 thousand tons per month. VSTP also steadily increases cargo handling speed: for three quarters of 2018, the Port handled 1 881 ship (+ 18% compared to last year), 92,8 thousand cars (+ 49%), sent 819 container trains to various regions of Russia, Central Asia and Kazakhstan (+ 33%). In 2017, VSTP set a record in terms of cargo handling, for the first time in its 120 anniversary, having processed 7,5 million tons. According to the results of 2018, VTPP plans to reach a new record figure - 10 million tons. Other materials: “63 new trademarks are added to TISCO in July-August 2018	Freight traffic on Transsib is closed for two days "